The G07 Navy Bellevue team has been a lot of fun to follow over the past year. In the Fall, the team was placed in the Classic 1 division. The girls were expected to finish in the middle of the pack, but the team looked at this as an opportunity to prove everyone wrong. The girls showed up ready to play each and every session and game and took the league by surprise. The girls edged out a talented RSA squad to take home the first-place trophy as they won every single game going 10-0-0. The girls had an outrageous goal differential as they scored 55 goals and only conceded 3 goals all season. Coach Jack and the rest of the staff were ecstatic over the team’s ability to overcome every obstacle in dominating fashion. In the Spring, the girls stepped up a division to test the team’s abilities. The team competed in the Super League 2 division against much stronger opponents. Coach Jack and Assistant Coach Jaynie were excited to see how the team faired and once again, the girls rose to the occasion. The girls played an 8-game season and finished with a record of 4-3-1. The girls finished in 2nd place and on top of that, they were the only team to get two results against the first-place team. 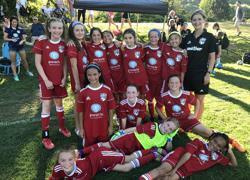 The girls tied both matches against the eventual 1st place team, and no other team came within 2 goals of getting a result against the champions. The G07s will look to have another stellar year and we are excited to see how they progress in their team and player development. GO TITANS!